How to know which one is right for you? I will try to explain it in today’s post. 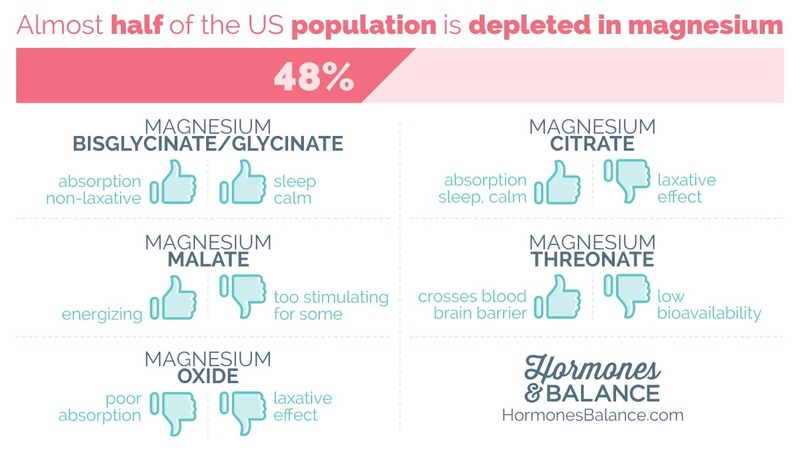 Let’s not forget that magnesium also plays a huge role in hormonal balance. Which form of magnesium is right for you? Also known as magnesium chelate, magnesium diglycinate, magnesium glycinate. It is a highly absorbable form of magnesium chelated to two molecules of the amino acid glycine. This is the form of magnesium I take every day. I would double up to 600mg, or even 800mg per day if I’m stressed, or when I’m traveling (also a form of stress). “Chelated” forms of a mineral mean that an amino acid has been attached to them making them a very stable form of magnesium that is less likely to cause gastrointestinal symptoms and reduces the laxative effect. Yet, it helps with PMS, fibrocystic breasts, sleep, anxiety, cravings, pains, and cramps. Another chelated type of magnesium bound to citric acid. This form of magnesium is about 30% bioavailable, but it pulls water into the bowels giving it more of a laxative effect, which some may like if suffering from chronic constipation. For a deeper dive into constipation, check out this article. This is a good form for you If you feel depleted in magnesium (based on the symptoms) and struggle with chronic constipation. Whenever I travel, I bring along a bottle of citrate to keep things moving. Another type of magnesium bound to malic acid. For those having issues with energy production, a magnesium malate supplement may be effective for helping with chronic fatigue syndrome and/or fibromyalgia. No surprise, this form may be too stimulating for some and may disrupt sleep, especially when taken at night (I had this experience first hand!). The brand I recommend: Magnesium Malate. Threonate is a form of magnesium chelated to threonic acid, a metabolite of vitamin C.
This form of magnesium in comparison to others was created to cross the blood-brain barrier – it may, therefore, improve learning and memory functions and maybe be especially beneficial for age-related cognitive decline. The suggested dose is 2,000 mg of magnesium threonate. The brand I recommend: Pure Encapsulations. Chloride is a form of magnesium for topical use. The skin is a great way to increase magnesium levels and bypass using the gut – this is especially beneficial for people with IBS (or leaky gut) who suffer from malabsorption of nutrients. The brand I recommend: Quick Magnesium. It is a pure, 100% natural solution of magnesium chloride, coming from high-quality magnesium salt derived from the depths of the earth’s interior – all from the ancient Zechstein Seabed in Europe. Ultra-pure and untouched by pollutants, this magnesium salt was protected at depths of 5,000-6,500 feet in this seabed for the past 250 million years. Many of our program participants have reported fantastic results using this form of magnesium; from pain reduction, feeling calmer, to deeper/longer sleep. Epson salts are in this form. Great for external use (such as baths). Internal use can cause severe diarrhea. People with certain genetic variance don’t tolerate this form of magnesium very well. Oxide contains a lot of magnesium by weight but has a bioavailability of only 4%. This form is found in many magnesium supplements and should be avoided. Therefore, I have no brands to recommend here. I’ve also found that many MLM (multi-level marketing companies) use this form of magnesium in their product line-ups. Used as a coating agent in supplements, not soluble in water, therefore should be avoided. Only has 4% bioavailability and can cause negative reactions. Companies that use it tend to add other low-quality ingredients. I do not recommend using it at all. It is derived from lactic acid which is milk. I recommend avoiding dairy in any form. Studies show that it does not dissolve well in water, its bioavailability is therefore low. I hope this article was helpful in getting you on board to replenish your magnesium levels and one step closer to rebalancing your hormones! If you want to read up more about the causes of magnesium deficiency, the dosages and which are the magnesium-rich foods – go to this article. Lack of magnesium and endometriosis? We’ve had people improve from all forms of good quality magnesium. Malate isn’t the only one. As mentioned in the article, I caution against malate being overstimulating for some. Which one would you use as an Estrogen blocker? I have tried a lot of different magnesium pills but I have slight case if ibs and it always seems to give me gas and boosting with cramps in my stomach. I have problems staying asleep at night , hope was told magnesium should help. What do you suggest for me ? Article says “Magnesium chloride is a form of magnesium for topical use.” I have gotten magnesium chloride flakes and soaked in the bathtub with them. ReMag helped me overcome restless legs, insomnia and the last few symptoms of MS.
Hi Marvell. My husband was diagnosed with MS and suffers with severe cramps all over his body. Legs, chest, feet, arms. It’s terrible. We will try the ReMag. Are you still having symptoms since taking ReMag? Which calcium would I benefit from.. When is the best time of day to take magnesium. I take magnesium glycinate. So the glycinate was recommended for help with sleep. I took 1 pill 45 minutes before bed. I was buzzing all night! No sleep. The article recommends the Magnesium chloride topical version for people with digestive issues. Which magnesium do you suggest that won’t give you diarrhea. braca rest came back negative for gene mutation and no cancer spread to lymphnoids. I will need 4 weeks of radiation and most likely will be taking medicine for 5 years. Hi Lisa, I recommend to look up Dr V from Breast Cancer Conqueror and applying her protocol. Should magnesium be taken with another supplement for better absorption? Like calcium or vitamin d3? It seems this question has been asked several times, but no answer has been provided. I would be interested in a response. Is it possible to overdose on Magnesium? I’d also like to know more about mag hydroxide. Is it absorbable or just a good laxative? Whatabout Aquamin mg? never saw a response to Lynn. the product you recommended has Mg Oxide in it which you said to not use. Our readers would like to know this answer. I read that magnesium citrate can interfere with Ceruloplasmin & can cause iron dysregulation .. what does Magdalena think? Can you take 2 different types at one time ? And which would be best for PCOS Thank you .